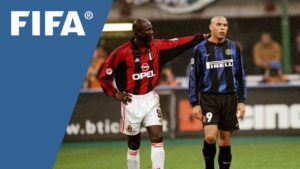 1995 FIFA world footballer of the year George Weah has been confirmed Libria’s president-elect. LIBERIA–Liberians and football lovers all over the world have joined together in celebrating George Weah’s presidential victory in the country’s first democratic transfer of power in decades, as the former striker vowed to usher in a period of change. Idolised in Liberia as “Mister George”, Weah is to be sworn in on January 22, replacing Ellen Johnson Sirleaf, who in 2006 took the helm of the West African country first founded for freed US slaves. The electoral board confirmed Weah’s run-off victory on Friday evening, as his rival, Vice President Joseph Boakai, conceded defeat. “My fellow Liberians, I deeply feel the emotion of all the nation. I measure the importance and the responsibility of the immense task which I embrace today. 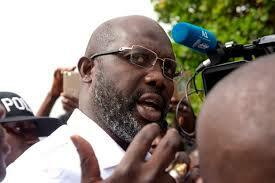 Change is on,” Weah said on Twitter. A victory speech, however, was postponed after crowds of energetic supporters gathered around a podium for Weah’s address grew too boisterous, an AFP correspondent said. George Weah (left) during his playing days. Right is former Brazillian super star Ronaldo Da Lima. File photo. The White House called the vote “a major milestone for Liberia’s democracy” while UN Secretary-General Antonio Guterres applauded “all Liberians for the successful completion of the elections process, which was conducted in a peaceful environment”. Sirleaf’s predecessor Charles Taylor fled the country in 2003, hoping to avoid prosecution for funding rebel groups in neighbouring Sierra Leone. Two presidents who served prior to Taylor were assassinated. Weah’s former club Paris Saint-Germain tweeted its congratulations to the “world football legend on the latest chapter of his brilliant career!! !” while former Chelsea star Didier Drogba, Manchester City midfielder Yaya Toure and Marseille’s former Cameroon midfielder Stephane Mbia also sent their best wishes. “I think the Liberian people will expect… Weah’s presidency to (have a) pro-poor, pro-growth policy that will put the people at the centre of national development,” said political analyst Vita Ishmael Tue. He added that he expected Weah’s presidency to see power “given to the people; the provision of education, youth training for disadvantaged and vulnerable youths that are on the streets and who see themselves in him”. Weah also had the backing of a notorious former warlord Prince Johnson, who sipped a beer as his men tortured former president Samuel Doe to death.